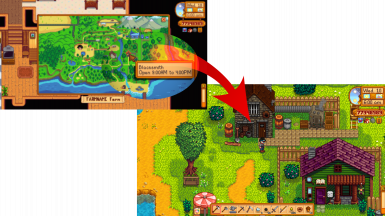 Fast Travel allows the player to quickly travel to any location on the map via left clicking on any icon. - Balanced Mode, which prevents the player from fast travelling unless they are on a horse, and blocks fast travel to Calico Desert altogether. - Changed spawn location of Quarry to the end of the bridge, fixes a visual bug seen when spawning directly in the quarry. Fast Travel is a mod which allows the player to fast travel to any location on the map, by simply left clicking the icon. This allows the player to quickly go from say, the mines, to the blacksmith. As this is my first mod, I decided not to add full support for others' mods, as it'd be biting off more than I could chew. Instead, I've opted to use a configurable system for each warp. These can be edited/added in the config.json file. If you had installed a mod which added a giant fountain in the middle of the town square, for instance, you could move the spawn position up a few tiles on the Y-axis(second number) to stop yourself from spawning inside of it.